Copşa Mare is a unique Saxon village situated in the heart of Transylvania just two kilometres from Biertan, a well-known UNESCO World Heritage site. The area is famous for its fortified churches, breathtaking landscapes, and undying traditions and culture. As is the situation with most rural parts of the country under threat of destruction by constant modern transformations, Copşa Mare was facing a change that would have altered the cultural and environmental heritage of the area. Paolo and Giovanna Bassetti, two Italian entrepreneurs living in Romania, decided to start a sustainable project in Copşa Mare that, through conservation and sustainable tourism development, would help protect this area and its uniqueness. It all started with a trip to Transylvania in 2005 when, by sheer coincidence, they arrived in Copşa Mare, saw a traditional house, and immediately imagined what it might be like to own it. After they bought that first house, they realised how important it was to maintain its identity and, on a larger scale, involve local inhabitants in the preservation of the village. In the following years, they bought two more houses which they transformed, paying meticulous attention to how they were restructured, into guest-houses for tourists. They also invited the local community to take part in the development of the initiative. The project was developed with the consultancy of a local architect - an expert in the style of Saxon villages - and the valuable local support from the villagers in the restoration, decoration, and activity planning. Local authorities facilitated the whole bureaucratic process. Florea Maria, the Vice-Mayor of Copşa Mare, foresaw that the project would bring opportunities to the community such as jobs, support for preserving cultural heritage, and important tourism development. "We encouraged them to continue with their initiative and, as a local authority representative, I supported them as much as I could," she recalls. In the year 2008, when Sibiu, Romania was a European Council-elected Cultural Capital of Europe, a consultation meeting was organised as part of the activities organised by the local authorities that year. Representatives from 17 villages from Transylvania signed a manifesto in which they committed themselves to respecting certain norms regarding the restructuring of the houses - more specifically, in the maintenance of rooftops, gate entrances, facades, and windows. The manifesto was promoted as one of the first commitments towards sustainable development in the area. Its main purpose was to facilitate the creation of a common fund, with both private and public money, that would provide financial support to villagers' restoring their houses in the traditional style. 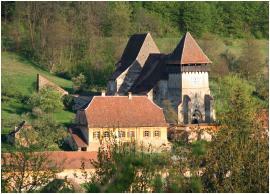 An exhibition was organised in Biertan with photographs showing the whole restoration process of the city of Sibiu. It was interactive display that trained people in a comprehensive way about how to better maintain the Saxon houses. Unfortunately, the creation of the fund did not materialize at that time because local authorities decided they would rather invest in developing the local infrastructure instead of contributing to the fund. Moreover, it was difficult to promote the conservation of the Saxon culture when there are progressively fewer and fewer Saxons in the area. The Italian entrepreneurs decided to create the fund on their own and announced to the inhabitants of the villages that they would cover certain expenses for them if they decided to redo the facades of their homes - an initiative which is still ongoing. What the local authorities do at the moment is to make sure that the declaration they signed in Biertan is respected and that the rural development plan is followed accordingly. This means no thermo-pane windows are allowed (a widespread practice in Romania). Moreover, only natural traditional pigments can be used for painting the houses. In April, when the restoration project in Copşa Mare was completed, the guest-houses opened, offering to those who decide to cross their thresholds unique culinary experiences, organized excursions in the surrounding areas, bicycle rides, horseback riding, and carriage rides. All these activities appeal mainly to foreigners who live in Romania and tourists. In an effort to propose interesting cultural activities, the Bassettis work closely with Foundation Adept, an important Romanian NGO which runs programs to preserve biodiversity in Transylvania. "What we do, basically, is encourage sustainable tourism development in the area. We are a mediator between tourists and local producers and pension owners and we do awareness-raising in order to preserve the biodiversity by proposing guided nature tours, among many other activities," said Lenke Balint, Regional Tourism Developer. The Foundation also introduced the Slow Food concept in Romania, encouraging the preservation of traditional Saxon culinary treasures. A collaboration sponsored by Brookes Oxford University and the internationally-renowned food expert Rosemary Barron, Head of the Gourmet International Association and a promoter of the cultural importance of local cuisines, will start next summer with the goal of developing the tourism potential of Copşa Mare by training people to both make use of it and preserve it. Ms. Barron was the main force behind the local development plan and currently organizes Slow Food fairs and weekly dinners to encourage networking between local producers. Another activity planned for next year is a collaboration between The Anthropological University of Sienna and the University of Cluj. The institutions will jointly conduct an anthropological study of the historical, cultural, social, and religious background of Copşa Mare.